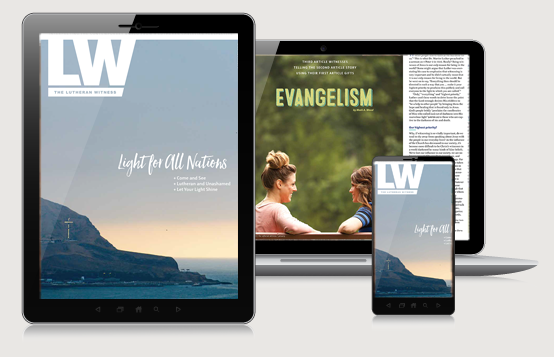 It is that time of year again to renew your subscription to The Lutheran Witness Magazine. It is also that time of year for those of you that are not current subscribers to get started. The subscription fee for this year is $22.68, one penny higher than it was last year. This price not only includes the cost of the magazine subscription but includes an insert from our own Iowa District West. The Lutheran Witness is a great way to keep up on the news of all that the Missouri Synod Lutheran Church is doing here at home and all over the world. There are two sign-up sheets attached to the kiosk/cube in the narthex. One is for those of you that are current subscribers and one is for those of you that are planning to start a new subscription. For those of you that are current subscribers please write either “yes” or “no” next to your name indicating whether you are planning on renewing your subscription. For those of you that are not current subscribers and want to sign up, the other sheet is for you. All we need is your name and address. The subscription year is from May through April, however everything has to be returned to LW by March 1st. As such, the last day to sign up will be Sunday February 17th. Your payment of $22.68 can be put in the regular offering plate or paid at the office. And yes, please make your payment by March 1st. If you place your payment in the offering plate, please make sure that it is clearly marked.